The APWA-MN Student Chapter hosted its start of the school year ice cream social on Friday, September 15! It was nice to meet folks and talk to them about the Student Chapter of APWA. It was also great to see some returning faces and chat with them over a tasty treat. First, Student Chapter members shared about upcoming events, which include: Speed Networking with Professionals, Hennepin County Lunch and Learn, FE Presentation, and the Student Member Dinner at the end of the semester. Next, they informed students about the benefit to the Student APWA Chapter of officially joining the Minnesota Chapter, as well as the benefit to student members of receiving a meal at the Student Member Dinner. Finally, since some of the Student Chapter leaders will be graduating this school year, they talked about student officer elections and suggested attendees run for a position. Along with university students, four of the five student officers were able to attend the event: Lauren Hagen, Angela Cao, Tyler Stricherz, and Joseph Dunlap. 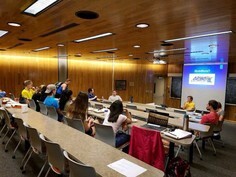 We hope to see you at the UMN APWA-MN Student Chapter future events!